Heat olive oil over medium heat in a medium sized pot. Add in the chopped kale stems and salt. Sauté for 3 minutes. Pour in the vegetable both and bring to a simmer. Cover, leaving the lid ajar to release stream while cooking. 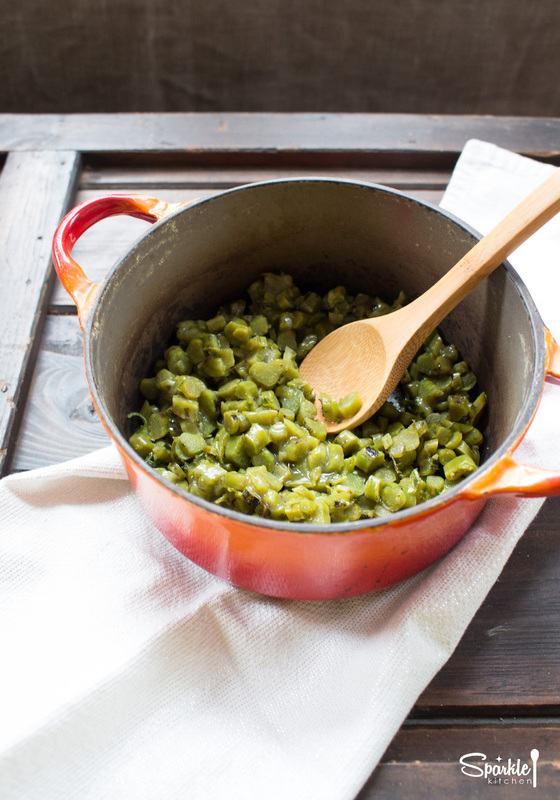 Cook for 10-15 minutes until stems are tender. Add more salt to taste. 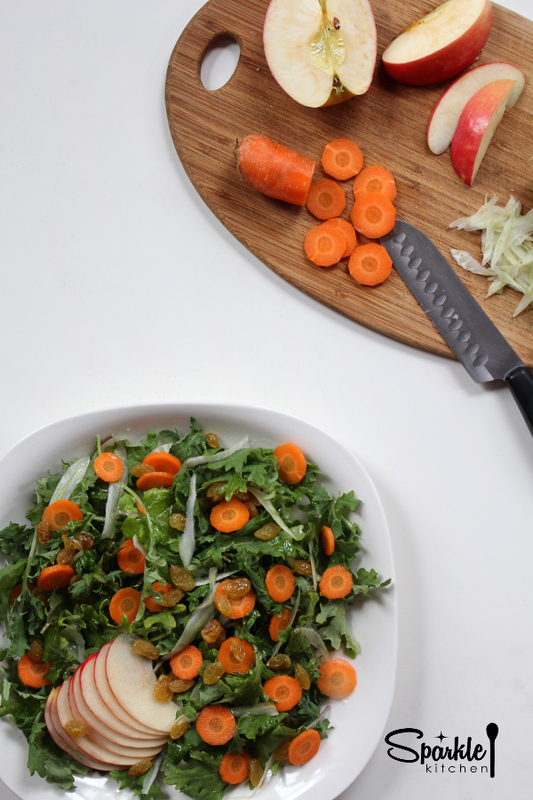 Check out the easiest way to remove kale stems in the video below. Hold the stem in your left hand and run your right hand down the stalk to remove the leaf. 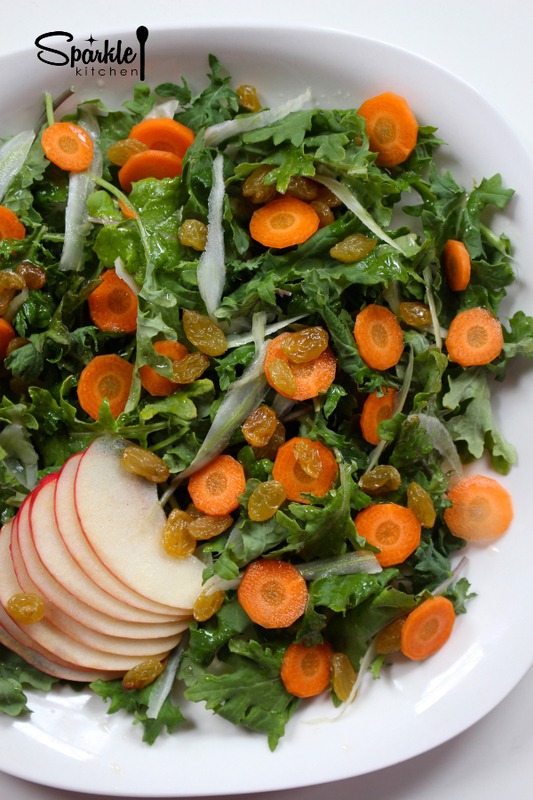 And then make my Massaged Kale Salad with the leaves! Potlucks are one of the great community builders. Never underestimate the power of food in drawing people together. This past Sunday the owners of my yoga studio hosted a potluck for all the volunteers. We sat around a long wood table in candlelight sharing stories, yoga experiences and food. Some of us had never met, yet by the end of the evening we were all good friends. There was a certain welcoming energy in the space that made everyone feel at ease. The act of full participation, of the give and take exchange shows kindness and I think that’s the beauty of a potluck. Everyone feels included to partake on the same level. It’s also relatable. Food is the great commonality. We all have to eat and we all have opinions on food. The yoga studio is a place where health is valued and there is a general consensus of eating for nourishment. Our meal was abundantly green, with four different salads, three kinds of brussels sprouts and ample fresh fruit. 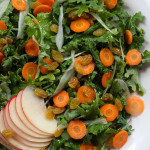 My contribution was this salad of baby kale, apple, carrot, fennel and golden raisins. 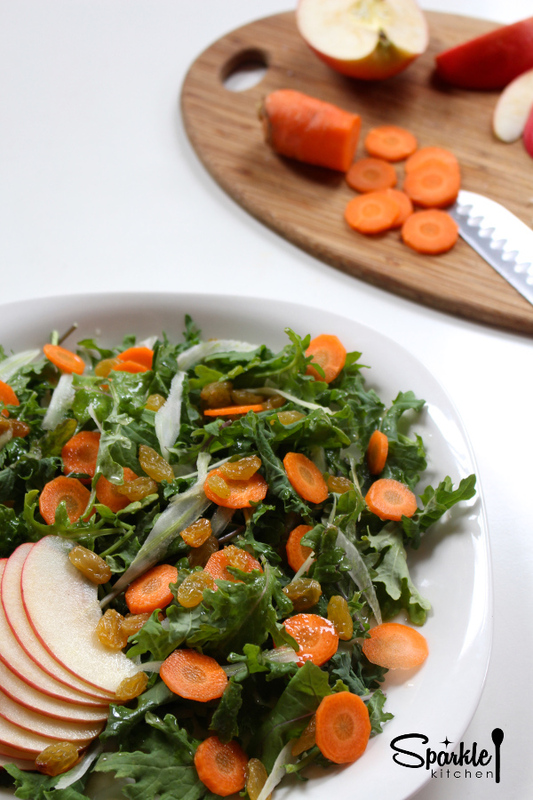 I kept the dressing light and simple taking care not to overpower the natural flavors. At the yoga studio, our community continues to grow. The studio owners plan to open the potlucks to all in the community later this summer and I’m looking forward to sharing more stories, making new friends and eating delicious food. 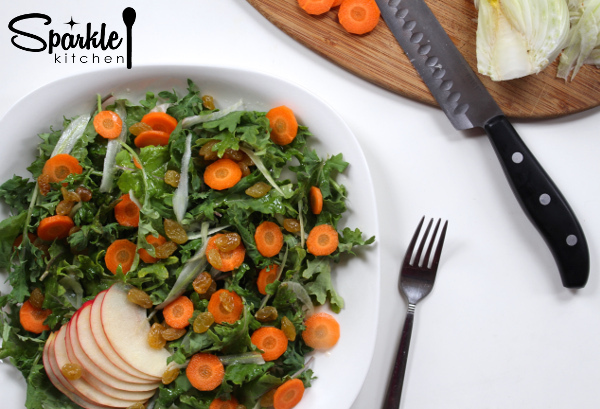 Baby kale, apple, fennel and carrot with a lemon olive oil dressing. Once everything is sliced and chopped, combine all in a large mixing bowl. Drizzle over the dressing and toss to coat evenly. For the dressing, combine the lemon, salt and onion then allow to sit a minute. Add in the oil, stirring to combine. I like to make my dressing in a mason jar so it’s easy to put a lid on it and save the extra. For shaved fennel, cut fennel bulb in half lengthwise. Beginning on the side of the fennel bulb, peel strips of fennel using a peeler.